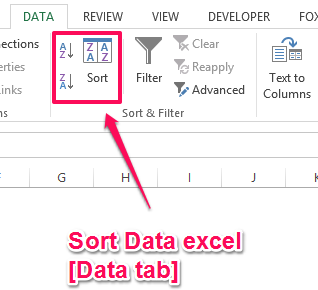 In Excel it is easy to sort data Excel using the sort button. Data can be formatted in any format but learning to sort data is very important. To sort data excel in the descending order use the large function along with the Row function. We can sort one or more columns in a single time. Sorting the data quickly helps us to reorganize our worksheet. Before sorting you need to decide whether to you want to sort single column or multiple columns. Sorting data is an integral part of data analysis. You might want to put a list of names in alphabetical order, compile a list of product inventory levels from highest to lowest, or order rows by colors or icons. Sorting data helps you quickly visualize and understand your data better, organize and find the data that you want, and ultimately make more effective decisions. Where Do you Find Sort function in Excel? Sort function is found at 2 places in Excel. One is in the Home tab Editing group Sort & Filter. The 2nd one is in the Data tab Sort and Filter group. 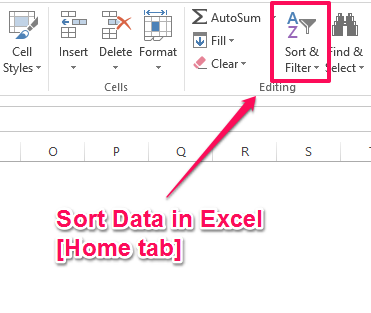 I would recommend you to use this option while sorting data. 1. Click on the cell in the sort column. 2. Press ALT + H + O. 3. You will see that the column will be sorted Z to A. Largest to the smallest value. 1. Select the entire data that you want to sort. Look to it that you do not select empty row or column. 2. Next step is to go to the Data tab sort function. 3. Sort dialog box will open in front of your screen. 4. Sort by what will be the questions so we will select alphabetically. And values largest to smallest. 5. We can see the name of the headers of the column we want to sort so select the names as well. 6. Press ok and your data will be sorted in the descending order. Sorting data is an integral part of data analysis. Sorting data helps you quickly visualize and understand your data better, organize and find the data that you want, and ultimately make more effective decisions.